Fru-Gal.org: Staying Focused: My Blog's Purpose. Staying Focused: My Blog's Purpose. You may have noticed a stronger emphasis on giving throughout my posts in the past few weeks. Being a blogger, specifically on the topic of frugality and couponing, it is easy to become distracted and try to keep up with some of the other "bigger" blogs. I have found myself reposting other blogger's content and losing sight of my purpose and passion for starting fru-gal.org in the first place. I hope this blog will be unique and that, as a subscriber, you will see a clear emphasis on the gracious act of giving, specifically through current giving opportunities, highlighted ministries, giving ideas, and ways to get high quality products for free (and then give them away to those in need). I also hope to provide you with creative, original posts as I strive to offer you easy, free ways to significantly bless others. I will still utilize other couponing blogs as resources for current deals, since these bloggers have already compiled and provided great amounts of information. And with much focus comes much peace (and sanity) on my part. So thank you for supporting me in this venture! I would love any feedback or post ideas as you help me in blessing others. 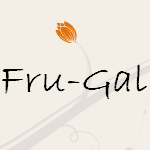 I also ask that if you have friends or family who would enjoy the heart of fru-gal.org, that you would tell them about this blog and increase its readership and impact. And please feel free to share with me your giving stories, they are a great encouragement.